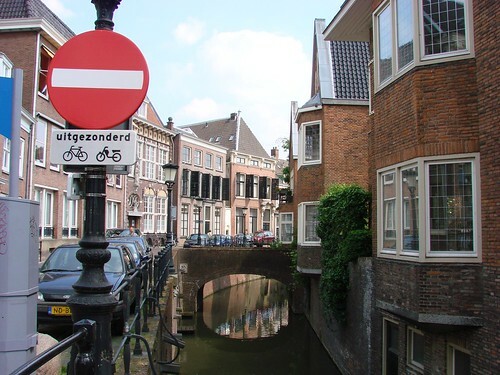 Like any big city that was around in the middle ages, Utrecht took its safety seriously and build walls around the city center. 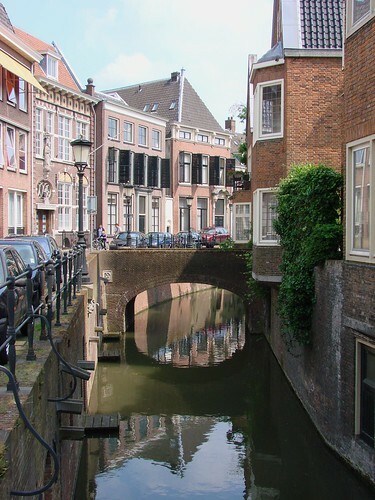 The city had the added benefit of an encircling canal, acting a bit like a moat. There were only four entrances into the city and one of those was on the eastern side. 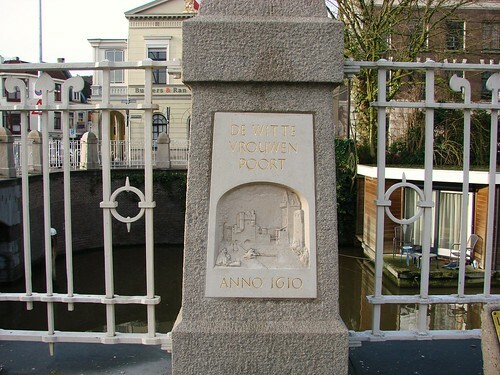 The Wittevrouwenpoort (gate) stood where the Wittevrouwenbrug (bridge) now stands. 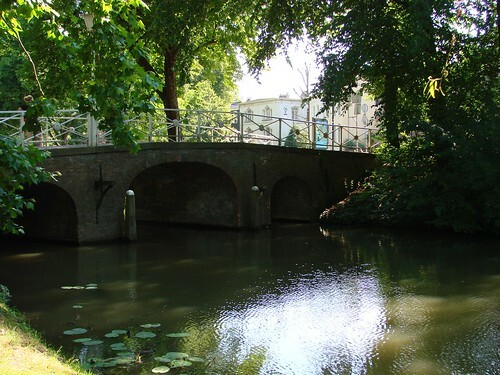 Wittevrouwen (white ladies) refers to the cloister that stood nearby until 1710. The gate stood there, in one form or another, until 1858, when it was demolished. It was still there in 1813 when the Cossacks arrived into the city. 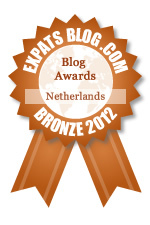 Not quite as impressive, I’m afraid. 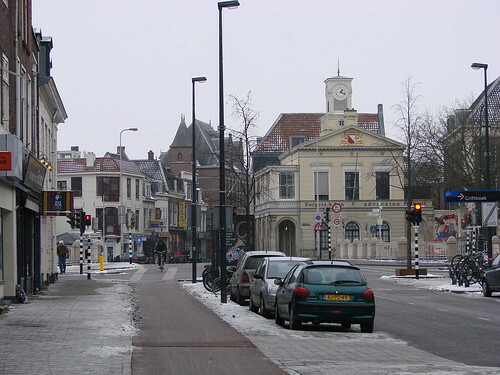 The building on the right with the clock tower was built when the gate was demolished, in essentially the same spot at the gate stood. 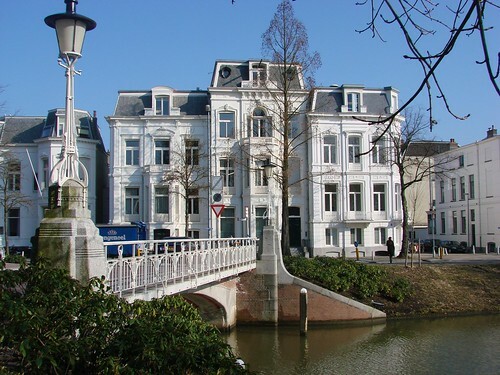 It served as a police station until 1980 and is now a lawyers’ office. Yesterday, on the bus home from the train station, I pondered getting off a stop early and having a short walk through a picturesque section of the neighborhood. But the cold made me reconsider and I thought I’d just get off at my normal stop. Except the bus didn’t stop there. I was taking a different bus than usual, so I’m not sure if it normally doesn’t stop there, but fortunately it didn’t go that far before the next stop. 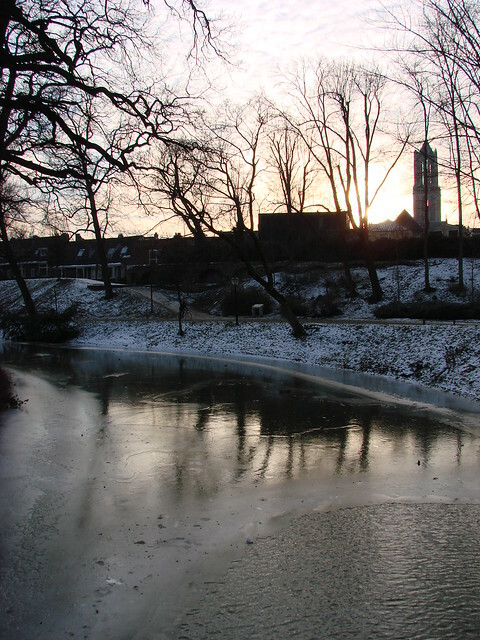 Best of all, because I was coming in from a different spot, I happened to notice this great view of the Domtoren with the setting sun and the partly frozen canal. I’ve never been happier to miss my stop. See that red and white circular do-not-enter sign? I came across a few of those this past Sunday while out for a more extensive bike ride. I’m still new to the bike-riding thing, despite having had my bike for almost a year now. Living where I do in the city center, it’s usually just as convenient to walk, and if I’m going somewhere a bit further, most likely I will want to walk, because then it’s an excuse to take my camera. Everything goes by too quickly on a bike; you can’t just stop as often as I do when I’m walking to take a photo. Anyway, back to the sign. Honestly, I wouldn’t have thought twice about the sign if it hadn’t been for the little pictures of the bicycle and scooter. Unfortunately, I didn’t know what the word uitgezonderd meant, so I didn’t know if it meant you couldn’t go that direction on bikes and scooters as well as in a car, or if it meant bikes and scooters were an exception. As I was still a bit wobbly on my bike, I figured I’d rather not chance it until I knew for sure what it meant. For what it’s worth, it means bikes and scooters are the exception and they can, indeed, go the wrong way down a one-way road. I figured as much, but suddenly, I was aware of rules of the road in a much different way than I have been since moving here. Since I don’t drive here, it’s easy enough to end up ignoring the bulk of the street signs, but once I ended up steering a moving vehicle (even if it is propelled only by my own force), all of the signs seemed to jump out at me. I am getting used to the bicycle stoplights, although at one point I admit to getting overwhelmed for a brief moment as I tried to find the bicycle light amid the regular traffic and walk/don’t walk lights. I blame the momentary panic on an incredibly sore tush. Despite any extra padding I may have, none of it seems to make riding the bike any more comfortable! I think I’m only now — Wednesday — not feeling the ache. I’m sure if I keep it up, my tush will eventually grow used to it … or numb. 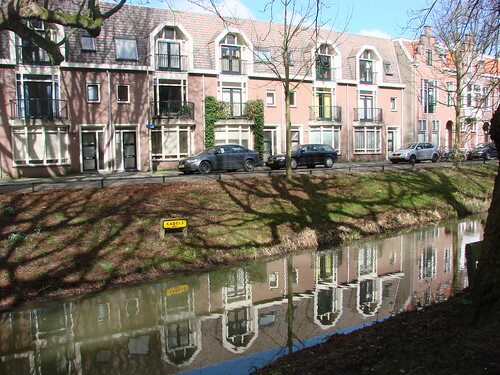 I leave you with another nicer shot of this canal and street, this time without the signs. Focus instead on those fantastic shutters on the buildings in the background, and the lovely bit of greenery reaching down to the canal below. 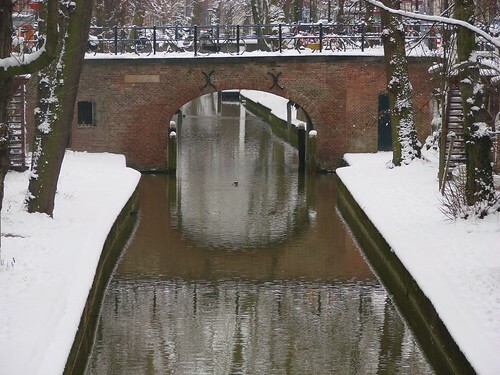 When I posted the photos of Atlas yesterday, I realized I never posted the other photos of the Nieuwegracht that I took that day in December. 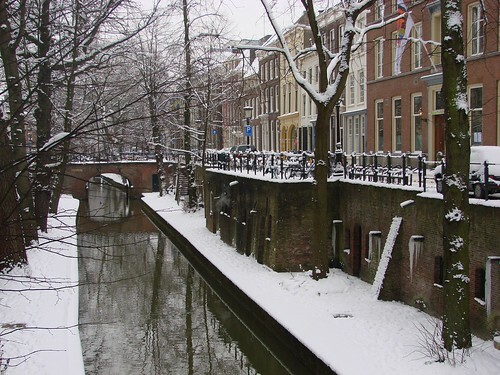 The Nieuwegracht is beautiful, stately and charming at any time of year, but with the coating of snow, it was something special. I saw this man walk out to the canal with a bucket and dip it in to get water, but my camera wasn’t fast enough to get the action shot, just the before and after. 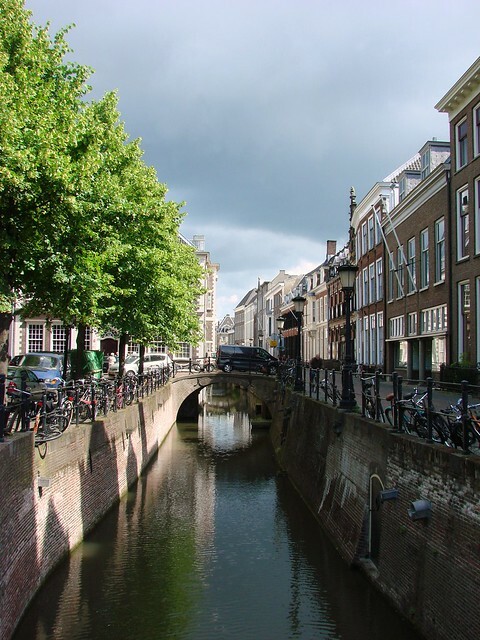 It’s a long, quiet street, filled mainly with private residences and businesses, rather than a lot of shops. 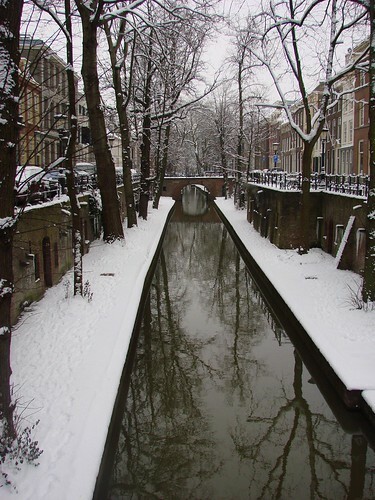 It’s yin to the Oudegracht’s yang, I suppose. 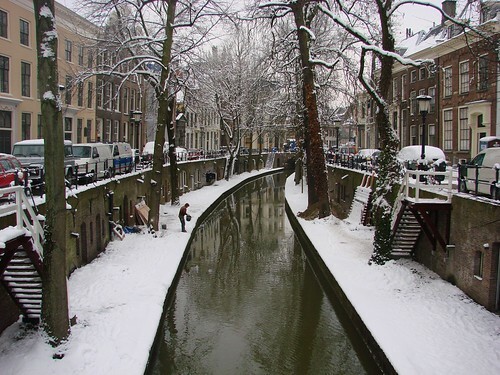 The Oudegracht is the more obvious tourist spot, but the Nieuwegracht is definitely worth a wander if you visit. 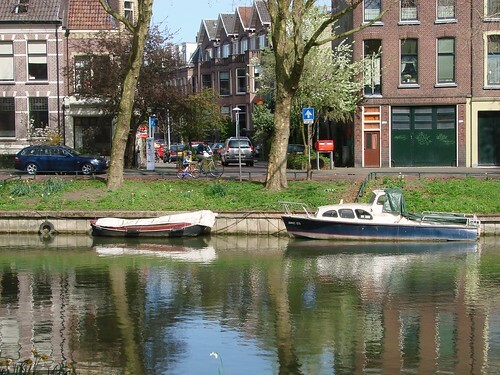 After all, both of them have the famous below-street-level wharves that are somewhat unusual.